One day last week, Ott DeFoe’s daughter, Lizzie, used chalk to write this on the driveway in front of the family’s Knoxville home: “The 2019 Bassmaster Classic Champion Lives Here.” Over three days of competition, her daddy then used Storm®, Rapala® and VMC® tackle to make that prediction come true. 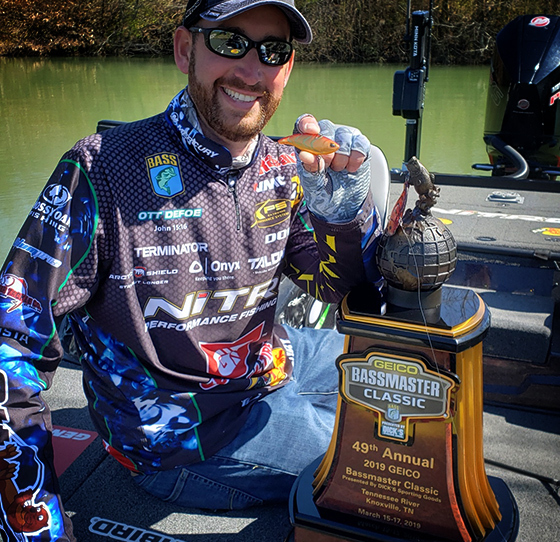 Fishing on Fort Loudoun Lake, located just a short drive from his driveway, DeFoe caught three 5-fish limits weighing a combined 49 pounds, 3 ounces to win the 2019 Bassmaster Classic. The Rapala Pro hoisted the trophy and made a victory lap with Lizzie and the rest of his family in front of roaring hometown fans packed to the rafters in Thompson-Boling Arena, home of the University of Tennessee men’s and women’s basketball teams. DeFoe’s victory, however, was not a layup. On day 2 of the three-day event, he lost a day-1 lead by turning in the bass fishing equivalent of an air-ball. After catching 20 pounds on Friday, he caught a disappointing 10 pounds, 5 ounces on Saturday to slip to 4th place, 2 pounds, 1 ounce behind the day 2 leader, fellow Rapala Pro Jacob Wheeler. “I was so mad yesterday,” DeFoe said Sunday on the weigh-in stage. “After that first day, I was on top of the world, but God will humble you sometimes, exactly when you need it. And that’s what it took yesterday. If I would have had another pretty good day [yesterday], I wouldn’t have adjusted. I wouldn’t have just went fishin’ like I did today — listened to my gut. I know I wouldn’t be in this position right now. “So you’ve got to listen to what God’s tellin’ ya,” DeFoe said further. “I needed a bad day yesterday and I survived that with 10 pounds. I needed to just get through that day.”DeFoe was the odds-on favorite to win the Classic in his hometown. Not only has he won three Bassmaster Opens on nearby Douglas Lake in recent years, in his youth he won and placed high in numerous tournaments on both Fort Loudoun and Tellico, an adjoining lake also in play for the Classic. “It’s a place that shaped me as angler, I fished down here so much,” DeFoe said in a press conference following his crowning as the reigning Bassmaster champion. Several of DeFoe’s fellow Team Rapala pros fared well in the Classic as well. Wheeler, the day 2 leader, was runner-up and Michael Iaconelli finished 4th. Brandon Palaniuk placed 10th and Seth Feider finished 15th. The field for the tournament, often called “The Super Bowl of Bass Fishing” comprised 52 of the best bass anglers in the world. On the tournament’s first day, four bass in DeFoe’s 20-pound limit came on a Storm Arashi Vibe lipless crankbait. Among those was a 6-pounder that was the biggest bass caught that day by any competitor. On Saturday and Sunday, DeFoe caught a combined three more of his weigh-in fish on a Vibe. The 4-pound, 7 ounce bass he caught Sunday on a Vibe allowed him to cull a smaller fish, solidifying his win. Lipless crankbaits like the Vibe often excel in the spring, when bass are first pulling up from deeper water and moving close to shallow spawning areas. To make his Rusty Craw-pattern Vibe more visible in Fort Loudon’s stained water, DeFoe customized its appearance with red, orange and black Sharpie markers. “I made it a little prettier than it comes out of the package,” DeFoe joked. Vibes start swimming at slower speeds than do other lipless crankbaits. They fall slower too, allowing you to fish them in shallower water at a slower speed. Featuring a soft-knock rattle, Vibes emit a unique single-cadence, low-pitch sound that attracts attention without alarming tentative fish. To give himself an even bigger advantage, DeFoe replaced the VMC stock trebles with No. 2 VMC Hybrid Treble Shorts, which he helped design a couple years ago. The innovative trebles combine the strength of O’Shaughnessy hooks with the hooking percentage of Round Bend trebles. While the O’Shaugnessy shape allows greater strength with a smaller-diameter wire – which improves landing percentage – it forms a narrower gap than most freshwater anglers prefer. 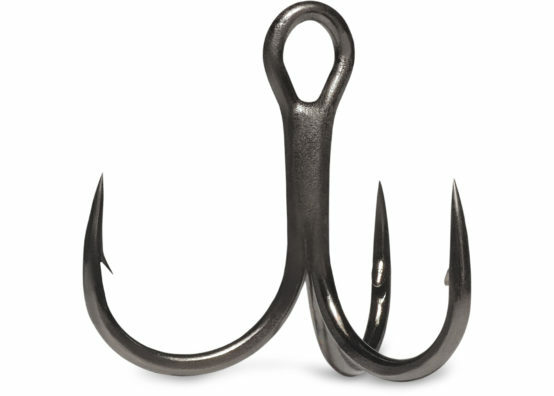 The gap on Round Bend hooks, however, is much wider, “so you definitely get the best hooking rate,” DeFoe said. One of the bigger bass DeFoe caught – a 4-pounder – came Friday on a Rapala DT-4 crankbait in the Dark Brown Crawdad color pattern. “DT” stands for “dives to.” Built of balsa wood, Rapala’s signature material, a DT-4 will get down to its maximum depth of four feet sooner than – and thus stay in the strike zone longer than – any other shallow-running crankbait on the market. The way a DT’s balsa body wobbles while swimming and digging its bill into the bottom makes it a perfect tool for triggering bites from shallow, early-season bass on waterbodies with little to no vegetation, like Fort Loudon and Tellico. Swimming with a side-to-side action only balsa baits can achieve, DT’s can back out of shallow cover better than copycat crankbaits, floating up and minimizing snags. As he did on his Vibes, DeFoe replaced the hooks on his DT-4’s as they dulled with VMC Hybrid Treble Shorts. “Those Hybrids are great for guys who have a lot riding on getting every fish that bites into the boat,” DeFoe said.Especially for a guy fishing a comeback bid to win a Bassmaster Classic in his hometown. This entry was posted in News, Pro Staff. Bookmark the permalink.